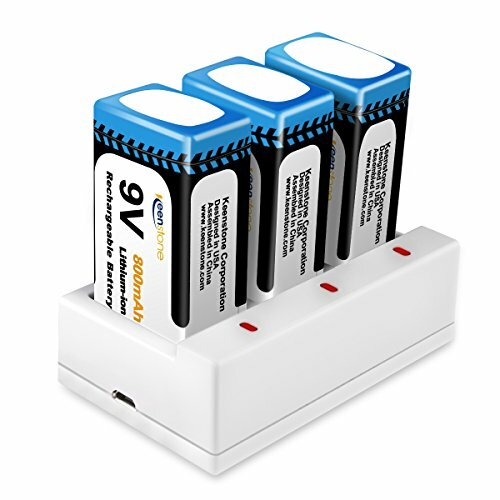 Battery Type: 9V 800mAh rechargeable li-ion battery with 3 packs, higher capacity than ordinary 9V battery, more affordable and environment friendly. Safety and Performance: Keenstone 9V Li-ion battery is non-toxic, without memory effect and environmental friendly. Cycles life can be up to 500 times. Smarter Battery Charger: 9V Li-ion battery charger based on 5V/1~2A USB DC input, easy and convenient to connect battery charger with power bank or adapter that about 1~2A. Fast battery charger: max 800mA output, only need 3h to fully charge 3 batteries one time. Easy to read each battery charging state with inserted LED lights for each independent channel.